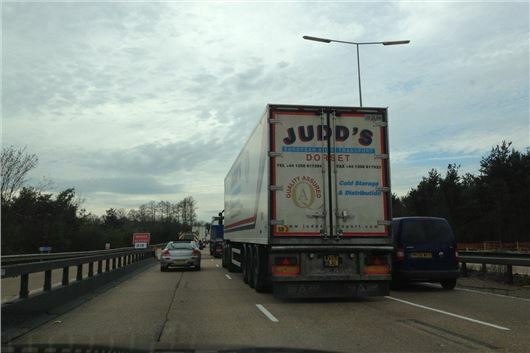 A Freedom of Information request by the IAM's 'Drive & Survive' has found that mandatory Tachograph HGV drivers hours breaks cause up to 1,700 road lane closures a year. HGV drivers are compelled to take rest stops wherever they are and whenever they reach the maximum hours they can drive in any one stint. The problem is, due to traffic conditions, road works schemes, and the lack of sufficient lay-bys, drivers can run out of hours before they can find a suitable place to stop, forcing them to park up at the roadside, taking out a lane. 85% of everything sold in the UK is carried by truck at some stage of the supply chain, with this number set to increase as more retail purchases are made online. The numbers come from a Freedom of Information request to Highways England into why motorways and major A roads were closed in 2014. Tachograph breaks are one of the top 25 reasons for lane closures, with 1,669 incidents last year. IAM Drive & Survive says one of the main causes of this problem is road infrastructure – insufficient numbers of laybys, a lack of services for commercial drivers and the impact of long distances of road works. Another is over ambitious-scheduling and poor journey planning by road haulage operators, compounded by the confusion of information as to when and where traffic jams are occurring. Researching routes with good facilities for drivers, looking up road closures in 'real time' and avoiding areas where traffic delays are common all help to avoid the need to stop in unsuitable locations. Lesley Upham, IAM commercial director, said: "Designing the roads and facilities drivers need to operate safely is essential, but meeting this objective needs a long-term approach. "Until then employers and drivers must remain aware of the challenges and plan their journeys as best they can. Radio road traffic reports and live traffic functions on satellite navigation systems have a role to play, but planning ahead and having an alternative route in mind is also essential. "There is also a great responsibility on employers to limit the time-based pressure put on their drivers. Nothing will delay their operations as much as a serious incident and if an accident occurs procedures will be scrutinised." Other significant reasons for road closures include abnormal loads (3,191) and vehicles shedding their loads (6,648).